Eskom Holdings, which supplies most of the nation’s electricity, has instituted daily rolling blackouts since November 29 to avert a total collapse of the grid – as it did in 2008 and 2015. Outages are set to persist for at least several months as the state utility’s new management contends with maintenance backlogs, construction delays and coal shortages. Eskom is also afflicted by deep structural and financial problems. It’s racked up R419-billion ($30.6-billion) in debt that it’s battling to service, and it isn’t selling enough power to cover its costs. While it anticipates a loss of more than R11.2-billion in the 12 months through March, its ability to fire thousands of surplus workers is constrained by militant unions and a government that’s gearing up to contest elections next year. 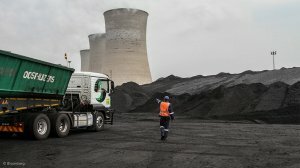 The utility, which has depended on state guarantees and bailouts for years to operate and borrow, has warned it may need more help to survive – money President Cyril Ramaphosa’s administration can ill afford. The company will propose the state absorbs R100-billion of its debt as part of a turnaround plan, Business Day reported, citing Eskom chairperson Jabu Mabuza. Although the energy department warned of pending power shortages in 1998, adding to generating capacity was low on the government’s list of priorities. After the government eventually recognized the looming energy crunch in late 2004, Eskom announced a series of multi-billion rand investments, including the construction of the massive Medupi and Kusile coal-fired plants. The honeymoon was short-lived. Molefe quit in late 2016 after the nation’s anti-graft ombudsman accused him of favoring members of the Gupta family, who were in business with then-President Jacob Zuma’s son, in handing out coal-supply contracts. Molefe, the Guptas, Zuma and his son all denied wrongdoing. In December, Ramaphosa replaced Zuma as head of the ruling party, and the following month a new board was appointed to rehabilitate the utility. Phakamani Hadebe, a former head of the Land and Agricultural Development Bank of South Africa, was named CEO and Jabu Mabuza chairperson, a post he also holds at telecommunications company Telkom. Less headway has been made in putting the company on a sustainable footing. Labor unions and the government derailed the company’s attempt to freeze the wages of its almost 50 000 employees. Eskom eventually agreed to pay increases of 23% over three years and a bonus to end a series of illegal protests. The company has also failed to pin down sufficient coal supplies, and a shortage of funds and skilled personnel have resulted in maintenance on its aging fleet slipping behind schedule -- both of which have made power cuts unavoidable. Medupi and Kusile, which were supposed to be fully operational in 2015, are still years away from completion, with their projected costs more than doubling to R292.5-billion. Eskom has hired Boston Consulting Group to develop a long-term strategic plan and Lazard Ltd. to provide financial advisory services. Just how they envision the utility digging itself out of the hole it’s in remains unclear, but one thing is certain: there are no easy answers.